Recent inquiries into the state of education in India have been riddled with questions that seem to offer no easy solutions to educationists, philosophers and social theorists. Some of the questions raised in debate are: while privileged Indians go on to receive education in institutions of repute, millions of people do not receive even primary education.1 Philosophers of education also ask whether the whole human being can be educated, as there is an increasing trend towards specialisation in technological and intellectual fields. What are the means of developing sensitive and bright individuals? Is competition, for example, the best way to facilitate learning?2 Can peace be a central objective of education? The reason why such questions have become virtually unanswerable is perhaps contained in the second question; the view that education is to be concerned with the whole human being – social, intellectual, emotional and physical rather than with specialisations in specific fields. For a few individuals in the history of the nation, these were not merely academic issues. Most literate Indians perhaps have at least a nodding acquaintance with the principles that Gandhi practiced – non- violence, non-co-operation, satyagraha, swaraj and so on. For Gandhi, these were creative principles that he sought to communicate to those he worked closely with, and to the public in general. Through the principles of non-violent resistance and self-reliance, Gandhi sought to create a culture where individuals engaged directly with the violence in their minds and hearts, and strove for the improvement of the society. Gandhi’s own creative impulse seems to have sprung from an intense involvement, and identification with the causes of oppressed people –first in South Africa, and later in India. An interesting way of defining Gandhi’s creativity has been developed by the psychologist Howard Gardner.3 To Gardner, an influencer belongs to the category of creative individuals who create a new field of human activity, by engaging with the minds of large groups of people so as to influence them in ways in which they think about themselves and the world. The influencer has a specific set of gifts –chiefly linguistic and narrative, so as to be able to reach out to large numbers of people through language and story telling. 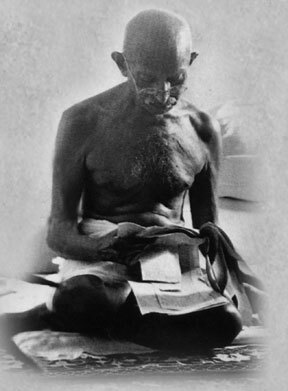 Gandhi’s specific gift as a narrator lay in revealing to individual and collective national selves the reserves of nonviolence and self-reliance latent in them. Gandhi’s vision of education is intrinsically linked with the idea of individual and national freedom. Nai Talim, or New Education, (proposed by Gandhi in 1937 as Basic National Education) had at its core the vision of freedom, but this also meant selfreliance and working for the benefit of society. He wanted to establish, after the exit of British rule, ‘a just, peaceful, non-acquisitive social order’.4 Nai Talim was conceived of as education for the whole of an individual’s life. A person’s latent capacities can be developed through the whole of life, and each individual ought to explore possibilities at different stages of life. A thorough attempt was made to replace the system of competition with that of co-operation. Competition – ranking children as ‘first’ and ‘last’, only causes envy and dishonesty. Children will, on the other hand, work untiringly on subjects that interest them, without any need for an artificial stimulus. The co-operative instinct is inherent in children. While many school settings may not allow for large periods of time for collaborative work, it might be possible in some instances to set aside time in each class when children work together – either on a set of mathematics problems or a project in art class. They could then have a discussion or presentation on how they went about it. Making discussion a classroom activity encourages them to interact and co-operate with those they normally don’t. This spirit of co-operation slowly might bring about a culture of sharing, working together in a non-violent manner. The stage known as Basic Education in the Nai Talim lasts from the seventh to the fourteenth year. The child is taught handicrafts, for this is crucial in the development of the senses and co-ordination. Schools could incorporate a craft (weaving, embroidery) or pottery element in their art curricula, rather than focusing only on the elements of western art – namely drawing, watercolour painting and so on. The alphabet, especially the English alphabet, is not to be imposed on the young mind – the first medium of instruction should be in the mother tongue. As the child grows older, she is to be taught cleanliness of body and surroundings. However in most schools, burdened with the need to master academic skills, the young child very quickly loses connection with her surroundings, and with a sense of beauty and order. The child becomes isolated, and often sad and frightened without this sense of order and connection with her surroundings. If a child, after a Basic Education has acquired a range of mental and manual skills, then she is in a position to have an excellent career in any field of her choice. All of Gandhi’s views on education were based mainly on moral principles. On reading about the life of Gandhi, one senses an intense personal involvement in everything he undertook or believed in. However, such a personal involvement was often aimed at a ‘higher truth’, derived from his interpretation of religious texts.5 It was perhaps from such reading that Gandhi derived his deep sense of morality and adherence to truth, which he sought to ‘influence’ students with. Thus, in his interactions with students, he spoke of values that he felt could not be ignored – respect for one’s parents, listening to one’s conscience, ‘to have compassion in one’s heart’ and in the context of the struggle for freedom from the rule of the Empire, fearlessness. Perhaps the trend in education will experience a shift in principles with attention to what Gandhi lived and taught, through personal experimentation and the example of his life. Extensive debate on the issue of competition and education that is holistic is carried out in the schools founded by J.Krishnamurti. For example, Journal of the Krishnamurti Schools ‘Competition and its Educational Consequences: Is there an Alternative?’ Shirali, Sailesh. Issue No.6 Ed. Chari, Ahalya (Chennai: KFI, 2002). Gardner, Howard. Extraordinary Minds: Portraits of Exceptional Individuals and an Examination of our own Extraordinariness. “Influencer: The Case of Gandhi”. (London: Phoenix, 2002): 104 – 123. Sykes, Marjorie. Foundations of Living (Pune: Parisar, 1988): 20. All points on the Nai Talim, its origins and philosophy have been used from the above text. Their incorporation into school curricula, however, is based on the views of the author of this article. Gandhi, Rajmohan. Mohandas: A True Story of a Man, his People and an Empire. (New Delhi: Penguin, 2006).